The tiny Golden Temple in Amritsar, India has a glorious setting. It resides by itself in the middle of the large blue sacred Pool of Nectar. The body of water is framed on all four sides by a backdrop of bright-white buildings (see photo). The Golden Temple is the Sikh religion's holiest of holy temples - and the bonding symbol of Sikhs around the world. Do not miss the tranquil and mesmerizing ritual that takes place inside the two-story Golden Temple. It is spiritually moving to both Sikhs and non-Sikh visitors. You as a visitor may observe the nonstop ceremony from the second floor balcony. It provides an up close view. As you look down from the railing, you watch and hear the original copy of the Sikh's Holy Scripture reverently read non-stop by robed priests from morning to night. The devotional mood is enhanced by a small group of musicians accompanying the chanting priests. The lavishly gilded, inlaid, bejeweled and mirrored interior decor also adds to the enthralling experience. The religious building complex was destroyed and rebuilt several times since its 16th century conception. 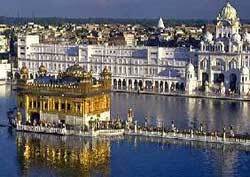 The Golden Temple we see today is two centuries old. The Golden Temple gained its name because its dome is gilded with gold, as are the temple's upper outer walls.